UPDATE: A reader has informed us that this was a hoax. I can't find proof either way, but it's a nice idea, isn't it? A high school student who goes by the alias "Kat Atreides" (she's either a big fan of Dune or Greek mythology) claims to have started an unusual library. Her strict school banned a long list of books, so she's decided to keep a selection of the titles in her locker to lend to her classmates. Read the post that caught people's attention here. Hero! Books should not be banned for giving an alternate point of view. There is nothing in those books worth banning! The Holy Qur'an, Come On! And half of those books are either required or recommended books at my school. She's deffinatally a hero. Who has rules against books? And she's standing up for something she believes in, and is helping fellow classmates to do the same. She's a real-live hero. I have read some of those books and there is nothing wrong with them. If being sad or having magic is wrong then those people are crazy. The Dune series is awesome!!!!!!!!!!!!!!! Of course she's a hero. But I don't get the name thing... I'm kinda tired and don't want to think, so does someone else want to explain this to me? I think it's cool what she's doing. I love the Brother's Grimm stories they're so much better than your typical fairy tales. This story is so amazing that I really wish it were real. But I doubt it. I think she took it down now, but when this question first became popular, you could see the other questions she asked before this one, one of which was "can someone give me a list of banned books from their school? because my school doesn't ban any." gah. pretty sloppy hoaxing. However, I hope this story, real or not, inspires someone else to be just as awesome! Banning books is a bad idea. 3. It's likely to get people up in arms about it. 4. It's mean! I mean, BANNING books? Banning BOOKS? 5. If this girl is accurate about the reason for the banning, then I would like to ask the school to point out exactly what is "anti-Catholic" about any of those books. Some of them are valuable additions to a good writer's or debater's repertoire. If you're going to ban a book, at least tell us why. 6. If you don't want your students reading a book, then don't ban it--that will draw attention. Ignore it completely. Most of those books I first heard about in school. There are easier ways(than banning) to make a book...disappear. And out of the books on this list that I've read, all of them are amazing. Well, some of the Grimm Brothers' stories are pretty gruesome (people chopping off body parts) but I think high schoolers could probably handle it. I've never read "His Dark Materials" but apparently they are anti-Catholic, (the bad guys are called the Magisterium, the "Jesus figure" is evil and gets killed). Frankly, I'm surprised that the Bible isn't on the list. I've heard it's the most frequently banned book in the U.S.. Anyone read "The Day They Came to Arrest the Book"? It's pretty interesting. 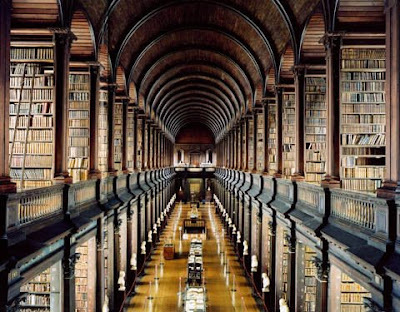 what library is the one in the picture? its look familiar, but i'm not sure. C) they should not ban the Qu'ran. i say shes a hero and also im a muslim its not fair that the quran should be banned especially if its not a catholic school and since when was bridge to terabithia hazardous to kids? the grimm brothers are grim but as long as like 2nd graders aren't reading them they shouldn't be banned! oh really that is just LAME and you cant keep kids from reading books they'll find a way to anyway. a)there is no good reason to ban books that have any ideals you don't like in them! c) on whether Kat is a hero or criminal-well, yeah, she did break the rules. But as I said before, these rules are totally not logical at all. So I would say she is more of a hero, wouldn't you? d) I gotta admit, this DOES sound quite a bit too amazing to be true. How can you fit over 60 books in a locker along with your other stuff anyway??? just watch sooner of later we're not going to be allowed outside because we might (and i emphasize might) by stung by a bee. HERO! I hate people who ban books. who bans bridge to terabithia???? That's cool! But, I have to wonder, why would Bridge to Terabithia be banned? I read it when I was in the sixth grade. The Divine Comedy (danet-Hell-Purgatory-heaven) needs to be read. even if you don't understand ANY of it. And the Fairy Tales...? Come on. And Hitchhiker's Guide to Galaxy is just hilarious. I recommend it strongly to anyone, even the movie. That picture is sooo cool!!! It looks ancient, mysterious, interesting, scary and sooo awesome! Wow, she is so cool. I have a feeling that the fact that she's getting other students to enjoy reading, her punishment would not be as harsh. Two people in my school got the swine flu! I think if one more person gets it, they're closing it down... So many people aren't going to school, and we have EXAMS. I think that's ridiculous.... If this isn't a hoax, it's awesome. seriously, what kind of school BANNS the brothers grimm?! That is synical. Total criminal, I've read most of those books. i don't get it! i mean, she is a total hero, but i don't know why she would even NEED to be a hero! why would BOOKS,of all things, be banned?! those books seem perfectly fine to me! whoever banned books totally doesn't have their brain wired right! (if they even have a brain...) the girl who fought against it totally rocks! she's got my vote for president! whoever banned those books totally doesn't have their brain wired right! (if they even have a brain...) the girl who went against that rocks! she has my vote for president! omg! South Ogden? Reel Dancer, i think we are in the same state! is your state's name 4 letters and end with an H? :} wow another kiki fan in my state... maybe anyway still cool! Hero. That is totally great. The reason they ban His Dark Materials is because it says that God was actually just the first angel who said he was more powerful than the other angels and so took over them. It says that the angels who faught against God (fallen angels) were right in doing so. If your not strictly Christian or something, it is an AMAZING AMAZING AWESOME AWESOME BOOK! All the books on that list that I've read are fab. I bet a few are banned because they have magic, the Qu'ran is banned for religios reasons (which is stupid, since America has freedom or religion) etc. ect. The only one I can't figure out why it's banned is Bridge to Teribithia. Mabey beccause it encourages imagination? (I know,that's a stupid reason, but the other banned books have stupid reasons too!) I really don't know. UU: "Maybe because it encourages imagination?" I totally agree with that. A lot of people so totally hate imagination, and that drives me crazy. Whatever. Reality is for people with no imagination. Hang on, it may not be against the rules to have them in schools, just in the school library. Like you can pray in public school, the school just can't run it. i dont understand why they banned Bridge to Terabithia. We read it for Grade 5 novel study! Anonymous i do live in a state with 4 letters and it ends in "H" that's makes me happy! "Bridge to Terabithia" is really, really sad. I guess that's the reason. Highschoolers should be able to handle it though. I actually think that a better strategy than banning books would be to read them, study them, and have a civilized discussion about the wrong ideas in them. I actually think it would be a good idea to read "Mein Kampf" in schools, and discuss it. Exposing yourself to bad ideas is a way to learn how to recognize them, understand why they're wrong, and learn to help others understand why they're wrong. She is totally a hero. All books should have place even if it is in a locker. What in the world with Mort! Discworld books aren't really bad! They're awesome and really funny! They do have cussing though. They probably thought that it was against Catholicism to allow a book with a Death figure. You know, with the robe and scythe and that. the brothers grimm isnt a book of fairytales. its THE book of fairytales. who in their right mind would ban it. run away, kat. run away. I say that she's a hero. many of these books are my favorites. did you know that Harry Potter was banned from some libraries in the U.S and the U.K? To Kill a Mocking bird was too. stuff like that makes my blood boil. arg.